It can come on so suddenly, completely without warning. You start the day feeling fine and then – BAM! Suddenly you’re experiencing serious abdominal pains and cramping, bloating, diarrhea, or constipation (sometimes both!). Was it something I ate? you might wonder as you rush to the restroom. The truth is, just about anything can cause these kinds of digestive upsets, but they’re also common symptoms of IBS. If you’re experiencing them regularly, you could be one of the 10–15 percent of the adult population in the U.S. that suffers from Irritable Bowel Syndrome. In fact, IBS is one of the most common conditions diagnosed by gastroenterologists and primary care physicians, according to the American College of Gastroenterology. But how can you tell if your upset stomach is really something more serious? Interestingly, IBS is diagnosed more often in women than men in the US — at almost twice the rate. Doctors aren’t exactly sure why, but some research suggests a connection between the hormones estrogen and progesterone and IBS symptoms in females. In fact, some women report increased IBS symptoms like back pain during their menstrual cycles. In general, IBS involves abdominal pain and changes in stools. Although anyone can experience pain or bloating from gas after a particular meal, and our stools are constantly changing based on what we eat, IBS symptoms tend to be persistent and frequent. Women who suffer from IBS often find they have certain triggers that bring on an episode, though these can vary from person to person. Some of the most common triggers include foods high in certain carbohydrates called “FODMAPs” (like onions, garlic, milk, wheat bread, pasta, and apples to name just a few), artificial sweeteners, smoking, carbonated drinks, and alcohol. Women also report more episodes during their menstrual cycles. Additionally, social and emotional factors like stress and anxiety can be triggers too. And when you’re suffering from uncomfortable digestive symptoms and worried about finding a bathroom, it can create a vicious, stressful cycle. Are IBS Symptoms Different in Males? If you’re a man who suspects you have IBS, the list of common symptoms above also applies to you. However, the added complication of the female menstrual cycle isn’t a factor (lucky for you, guys!). According to the International Foundation of Gastrointestinal Disorders, IBS is underreported in men, so there isn’t as much information about gender differences available. However, if you’re a guy reading this, the following info about the treatment and diagnosis of IBS applies as well! It’s important to note that IBS is not the same as Inflammatory Bowel Disease (IBD). IBD can manifest as either Crohn’s Disease or ulcerative colitis, but the common factor is an inflammatory response and actual inflammation in the intestines. IBD can also cause changes in the bowel tissues and raise your risk for colorectal cancer. But usually, in addition to IBS symptoms, people with IBD will experience symptoms like fever, bleeding, weight loss, joint pain, and eye problems. IBS doesn’t have an inflammatory response associated with it, and in fact, when doctors look at the GI tract of IBS sufferers, it appears normal. Unfortunately, there’s no quick and easy test to find out if you have IBS. The diagnosis is based entirely on your symptoms, and doctors call it a diagnosis of exclusion — meaning they have to rule out other conditions, like thyroid disorder or IBD, in order to make a diagnosis. Doctors look to a set of guidelines called the Rome IV criteria (developed over the last 15 years by experts meeting in — you guessed it — Rome!) to help diagnose IBS and other functional GI disorders. The criteria are a way to systematically eliminate other conditions based on your specific symptoms. IBS is medically defined as recurring abdominal pain linked with changes in bowel movement frequency and form, at least once a week for at least three months. The first and most important thing to do if you suspect you may have symptoms of IBS is to get a diagnosis. Try keeping a record of your symptoms that you can take to your doctor to help her understand what’s going on and make a faster, more accurate diagnosis for you. Your doctor will probably want to take a detailed medical history; this may be important, as there does seem to be some genetic component to IBS, and you’re more likely to have it if a parent does as well. Your doctor may also want to run specific tests to rule out other problems before diagnosing you with IBS. Once you have a diagnosis, treatment is all about managing your symptoms. When it comes to IBS, food is medicine. Many IBS episodes are linked to particular food triggers. Click to read this article and learn more about the FODMAP Diet, a.k.a. the best diet for IBS! FODMAPs are foods we eat every day--including some very healthy choices like beans and produce--but people with IBS don’t digest them well. This means that these foods pass into our colon where our gut bacteria starts to ferment them and produce gas. People with IBS experience hypersensitivity in the gut, and any kind of gas production can become uncomfortable and trigger diarrhea or constipation. For managing many IBS symptoms, females will particularly benefit from trying a low-FODMAP diet. By reducing the intake of these specific foods, research shows that up to 86% of people with IBS experience a significant reduction in the severity and frequency of their symptoms. 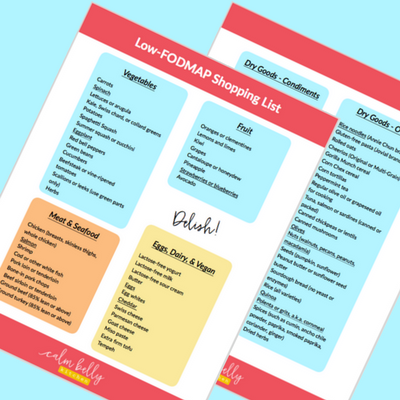 Want to know what foods are high or low in FODMAPs? Grab our free cheat sheets! 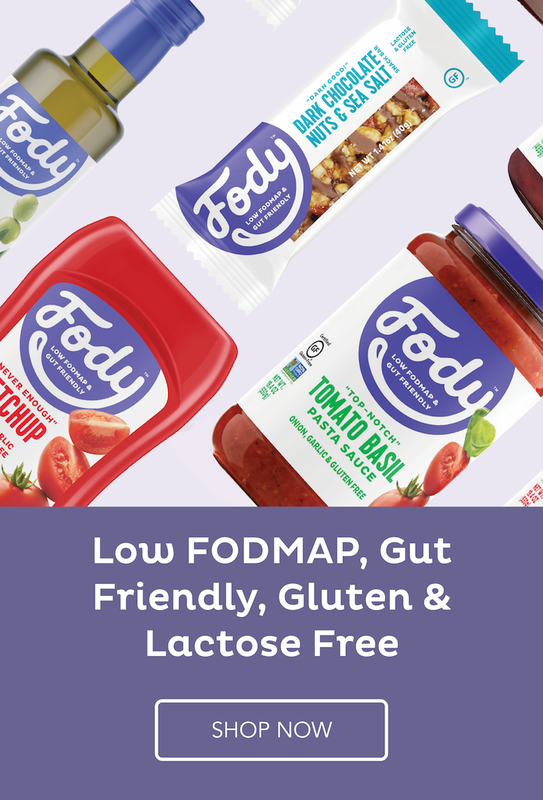 I always recommend starting a FODMAP elimination diet when you’re ready and then following a protocol to slowly reintroduce foods which allows you to identify your particular triggers--most people can eat some high-FODMAP foods WITHOUT experiencing symptoms. Once you’ve identified your triggers, you can drastically reduce future bouts of IBS. In the short term, your doctor may suggest over-the-counter medicines like laxatives and anti-gas pills to help with the symptoms, but these are only treating the result, not the cause of the problem. Doing a temporary FODMAPs elimination diet is a way of discovering the root causes of your discomfort and avoiding them in the future. In addition, many doctors now recognize a psychological component to IBS and may suggest therapy or counseling to combat stress and anxiety that may make your symptoms worse. There is some indication that antidepressants can help modulate nerve activity in your gut, but these drugs come with their own side-effects, so many doctors are hesitant to prescribe them for IBS. 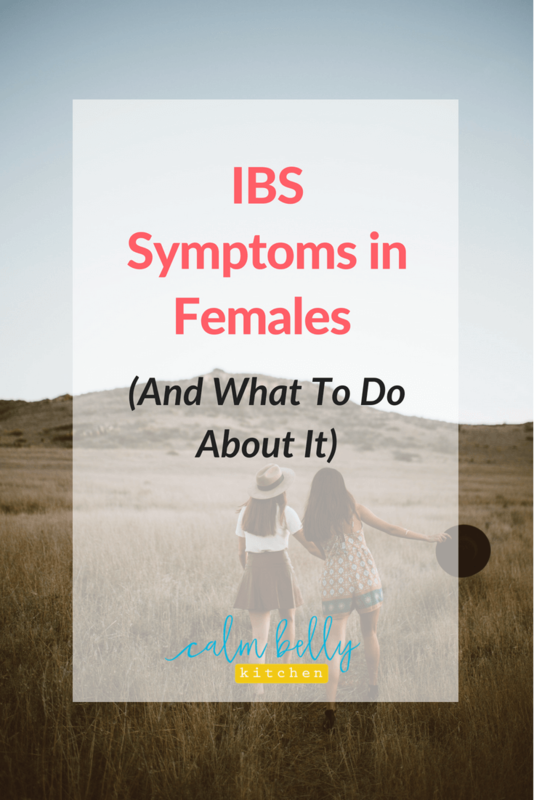 IBS is chronic, and there is currently no cure. But with the right tools and mindset, you can identify and eliminate your specific triggers to live a much more comfortable life.